The Apple Watch has saved several lives thanks to its heart rate monitor, which has been able to provide advance medical warnings to those who might have died otherwise. The new Apple Watch Series 4 adds a fall detection, designed to respond to a situation where the user has fallen and can't get up. 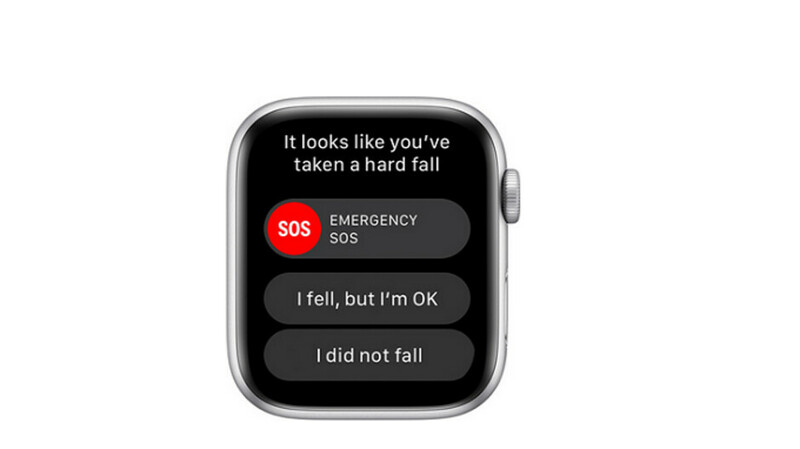 If the Apple Watch detects a fall, it will "tap" the person wearing the timepiece, sound an alarm, and give the user several options to choose from, including making a call to emergency services. If the watch detects no movement for about a minute, it starts a 15 second countdown. At the end of that period, it will automatically make that emergency call. A story in Swedish publication AftonBladet discusses what happened to 34 year old Gustavo Rodriguez, who had been cooking when he experienced severe back pain that felt like a knife twisting in his back. Rodriguez ended up collapsing on the floor, right in front of the hot stove he was using. Fall detection worked perfectly, tapping the man's wrist, sounding the alarm and asking whether Gustavo wanted the watch to call for help. Even though his phone was in the next room, the Apple Watch could have saved the day by summoning an ambulance. Instead, Rodriguez decided to call his mother-in-law, who lived close by, and she drove him to the hospital. The important thing to take away from this story is that fall detection on the Series 4 version of the Apple Watch is a feature that works, and could save a person's life. Fall detection is set "on" by default for users 65 years of age and older. Younger wearers can enable the feature at their discretion. But since anyone can fall, it probably is a good idea for all Apple Watch Series 4 wearers to have fall detection turned on, no matter how hold they are. And... no matter how 'old' they are, too! Classic PR article, this feature is bulls**t.
Life alert systems for falls have been available since the 80's and have saved actual lives! Look it up. Having this as a real working feature in a watch is just one more option and is not bulls**t.
I dont understand why people are speaking against this feature. The only downside is the cost of the watch just to have it. It was was lower in cost, like it's TRUE value of about $150. More people could buy them. May even could get to be a real medical option with money poured into the feature to improve it. And yes life alert has saved lots of lives. I wonder how it handles accidental falling? Or if you are doing an activity where you are constantly falling. You had to slip in a diss against Apple though, didn’t you? So, you think the cost to build something shouldn’t include labor, software development costs, and R&D? Something should only cost the price of materials because people work for free, lol. If it only cost $150, let’s see the one you built. Even if you still factor all those things, Apple's profit margins are still too damn high. If people still buy them, apparently not. Apple, or any company, is there to make money and grow. And there's that "they're a company, so it's okay for them to rip us off" thing again. The Apple Watch is inarguably the best smart watch being made with the best and most tech packed in a smaller footprint, at a price that is in line (or even cheaper) than the higher end android wear/tizen watches being made. It will even get firmware for many more years than those. So what is exactly your argument? That because it has the Apple logo, even though it’s a superior product for the price, is “ripping us off”? You may need to re-evaluate your user name, because yours is blatantly blinding you. If you have a source on how much it costs Apple, from R&D - building the software - materials - packaging - marketing - shipping - years of updates - logistics and other infinite things that it takes to get on the customers wrist, your assumption that it’s a “rip off” is a mute point and you have no argument besides you don’t like the price. First, I never said that the Apple Watch is bad, or not the best. Second, I made a statement that applies to all, fanboys from other brands also make that crap point. Third, you are clearly new to this site and don't know crap about me, you took what I said as a bash to Apple because you think I'm a fanboy of other brands? LOL Well, as if I can expect more from someone with his favorite brand's logo as his picture. My point is as clear as day, if you have a problem understanding it, read my previous comment again and again, and don't let your Apple fanboyism get in the way. I was hoping somewhere in that self defense you would eventually get to how Apple is ripping people off with the Apple Watch, or how their profit margins are too high. I’m still waiting. Give me an example of an Apple product without a huge profit margin. And if you don't think huge profit margins are not ripping you off, then you must be one of the fools who are easily parted with their money. I was hoping you would try to counter my claims of calling you an Apple fanboy. The burden of proof is on the accuser. Which you still failed to provide..
And yet you can't provide proof to contradict my statement. No one still made the component cost etc. of the Apple Watch, yet assuming it still has a huge profit margin is still a more educated guess than what your fanboy instincts tell you. Hopefully the next Apple Watch will offer butthurt detection, you sure need that feature. It is, until you need it. Let’s hope you never need it. Other manufacturers, please implement the same. This is a great feature hands down. My mom could use this, she's drawn to the floor. I know about that back pain. I blew a disk in my back while deadlifting 550lbs, and it still flares up to this day. Glad the watch worked as advertised for dude. It’s on, on my series 4, and won’t be turned off...never know. why is this being considered a huge deal? we have had fall detection devices for decades.